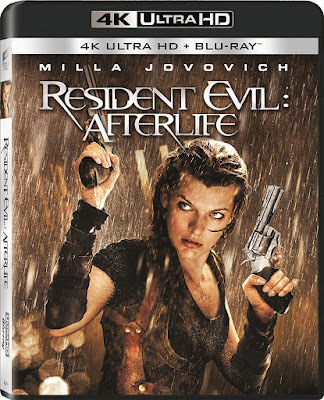 It may seem an odd choice to release the fourth film in the Resident Evil franchise on 4K Ultra HD before the first three, but it makes sense with knowledge of the production. First of all, Resident Evil: Afterlife marked Paul W.S. Anderson’s return to the franchise for the first time since the original film, despite retaining a writing credit on each of the films. That matter because of how visual Anderson is as a director, which was only enhanced for this release as he also made the choice to shoot the film in 3D. This is different than a post-production 3D conversion, and the difference is noticeable, even in 2D. All of this makes for a remarkably visual film, perfect for 4K presentation. Afterlife picks up where the previous film (Resident Evil: Extinction) left off, with Alice (Milla Jovovich) still fighting the Umbrella Corporation as Claire Redfield (Ali Larter) and K-Mart (Spencer Locke) make their way to Alaska towards rumors of refuge from the zombie apocalypse. After a highly impressive action sequence as Alice takes down a major Umbrella Corporation fortress hidden underground, the film returns to a simple survival narrative. Alice reunites with Jill, who is unable to remember what happened to her or where K-Mart is, and the two of them take refuge in an abandoned prison that is inhabited by a group of survivors. Anderson seems to be making a subtle statement with his choice of characters in the prison. On one hand, he continues the narrative established by the video games by including Jill’s brother, Chris Redfield (Wentworth Miller) among the survivors. On the other hand, Anderson makes the most villainous and selfish of the inhabitants a movie producer (played by Kim Coates). Could this be a commentary on Anderson’s experience with film executives? Or is this merely because this section of the film takes place in Los Angeles? Even worse than the self-serving movie producer is the franchise’s real villain, a rejuvenating and supernatural adversary known as Albert Wesker (Shawn Roberts), who Alice must face off against two separate times in this film. Though this film takes the narrative back to zombie-narrative basics for a large portion of the runtime, it is book-ended by sequences of sophisticated science fiction technology and action elements taking precedence over horror. Fans of the video game series may also appreciate how faithful the film attempts to remain, from plot points to costume choices, but you don’t need to be a gamer to enjoy the pure spectacle of Anderson’s stylistic approach. I would never call Resident Evil: Afterlife a great film. It may not even be a good film, but it is a wholly enjoyable one. There are few film more visually polished, making this the perfect choice for a 4K Ultra HD upgrade. Nearly every scene in the film features some type of visual spectacle, gorgeously shot and crammed with non-stop action. Even if much of the film is on the darker side, there are sequences with color that pop like never before, and the audio is just as impressive as the visuals. This is also a film of contrasts, with some of the set pieces being completely white while others are in the dark of night, and they each look equally impressive in this presentation. Though the 4K presentation is new, there are no other additions to this release that haven’t previously been made available. Even the Blu-ray copy included is just an old disc from the original Blu-ray release, which is made obvious by the outdated movie trailers included on the disc. The Blu-ray is also where the special features are included, meaning that they are exactly the same as have been previously released, including a commentary track with Anderson and a couple producers, a picture-in-picture feature with pre-production materials and cast interviews, and 7 making-of featurettes. The 4K release also comes with a Digital HD copy of the film.